The answer to this question is not direct. Yes, plants need oxygen for respiration but at the same time they also give out carbon dioxide. Thus, plants have proper system to ensure the availability of oxygen. Unlike animals, plants do not possess any specialized organs for exchange of gases but they have lenticels and stomata (present in stems and leaves respectively) that carry out the function of gaseous exchange. Plants do not have any specialized organ to respire and exchange gases because each part of the plant takes care of the need of gases themselves. The parts of the plant do not display any great demand for exchange of gases. Added to this, stems, leaves and roots respire at very lower rate as compared to animals. But during the process of photosynthesis, large exchange of gases takes place and each part of the plant is well adapted to fulfill its need of gases. Availability of oxygen is not a problem during photosynthesis because the cells release oxygen within cells. It is important to note that each living cell in a plant is located quite close to the surface of the plant and in case of stems, the living cells are arranged in the form of thin layers beneath and inside the bark and have openings which are referred as lenticels. Thereby, the respiration and translocation takes place at every part of the plant. During the process of respiration, O2 is utilized and carbon dioxide, energy and water are released as products. There is also a situation when then the oxygen is not available. For instance, the first cell on this planet must have carried out reaction in the absence of oxygen and even in the current living world we are aware of several living organisms adapted to anaerobic conditions. Some of these organisms are facultative and some are obligate. In any of these cases, all living organisms retain enzymatic machinery to partially oxidize glucose in the absence of oxygen. 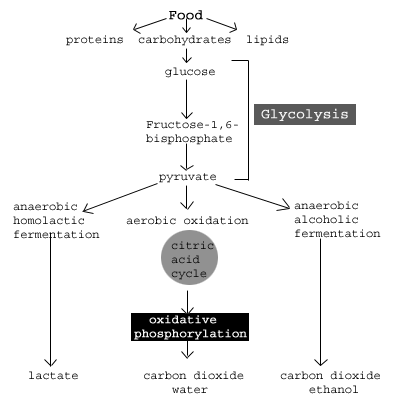 This process is also called as Glycolysis which includes breaking down of glucose to Pyruvic Acid. Air occurs in several interspaces of soil. The hairs of the roots are in direct contact with them. Oxygen of the soil gets diffused via root hairs and reaches all internal cells of the root for respiration. Carbon dioxide produced during the diffusion is released in the opposite direction. In the condition of water logging, air gets deficient in soil and in this case, metabolic activity of the roots declines. The stems of herbaceous plants possess stomata and the air gets diffused via it and reaches the cells for respiration. The carbon dioxide produced during the process gets diffused in the air via stomata. When the stems are woody, this gaseous exchange is carried out by lenticels. Leaves of the plants have tiny pores which are referred as stomata. The exchange of gases takes place by the process of diffusion via stomata. The stomata are present in large number on lower surface of leaves of plant. Each stoma is surrounded and controlled by Guard Cells (two kidney shaped cells). Then the stoma, open gaseous exchange takes place between Atmosphere and Interior of Leaves. Aerobic Respiration: In this type of respiration, the food substances are completely oxidized into H2O and CO2 with the release of energy. It requires atmospheric oxygen and all higher organisms respire aerobically. Following figure shows the steps included in Aerobic Respiration. Anaerobic Respiration: In this type of respiration, partial oxidation of food takes place and energy is released in the absence of oxygen. This type of respiration occurs in prokaryotic organisms like bacteria and yeast. Ethyl alcohol and carbon dioxide are formed in this process. The term glycolysis is derived from two Greek words, i.e. Glycos which means sugar and lysis means splitting. The scheme of glycolysis was given by Otto Meyerhof, J. Parnas and Gustav. In case of anaerobic respiration, respiration is carried out via glycolysis which occurs in cytoplasm of the cells. In it, partial oxidation of glucose is carried out resulting in two molecules of pyruvic acid. Glucose and fructose are phosphorylated to give rise to glucose-6-phosphate via enzyme hexokinase. This phosphorylated glucose is isomerized to produce fructose-6-phosphate. During the conversion of glucose into glucose-6-phosphate. During the conversion of fructose-6-phosphate in fructose 1 and 6-diphosphate. In this process, the incomplete oxidation of glucose is carried out under anaerobic conditions via set of reactions where pyruvic acid is converted into ethanol and carbon dioxide. These reactions are catalyzed by two enzymes, i.e. achohol dehydrogenase and acid-decarboxylase. Other organisms such as bacteria produce lactic acid from pyruvic acid. The detailed steps are depicted in the figure below. In animal cells as well, during muscle exercise, in case of inadequacy of oxygen for cellular respiration, pyruvic acid is reduced to lactic acid by lactate dehydrogenase. NADH+H+ are the reducing agent which is oxidized to NAD+ in the process. In both alcohol and lactic acid fermentation, very less energy is released. Both these process are hazardous because alcohol or acid is produced during the process. Fermentation process is used in our daily life such as in the formation of curd, vinegar, bread and alcoholic drinks. The hydrogen atoms, that leaves 3 molecules of CO2. Passing on of electrons removed as a part of hydrogen atoms to molecular oxygen with simultaneous synthesis of Adenosine Triphosphate (ATP). Pyruvate, formed during glycolytic catabolism of carbohydrates in cytosol, enters the matrix of mitochondria and it undergoes oxidative decarboxylation by the complex set of reaction. This entire process is catalyzed by pyruvic dehydrogenase and this reaction requires involvement of several coenzymes such as Coenzyme A and NAD+. 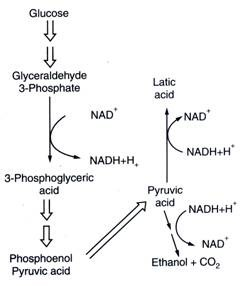 During this entire process, 2 molecules of NADH are produced from the metabolism of 2 molecules of pyruvic acid. The acetyl CoA enters into a cyclic pathway called as Kreb’s cycle or tricarboxylic acid. The name Krebs Cycle is mentioned after the name of scientist Hans Kreb who first elucidated this cycle. NADH and FADH2 carry electrons to the Electron Transport System. After the completion of Krebs cycle, oxygen enters in pathway as the electron acceptor at the end of electron transport system. 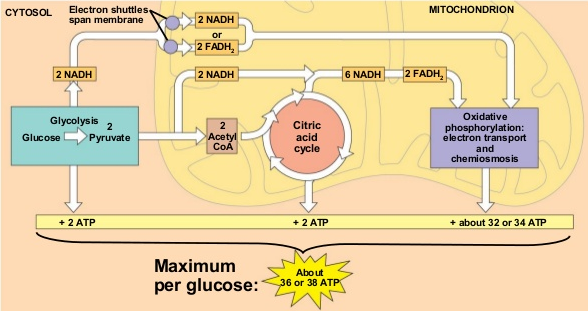 “The metabolic pathway, through which the electron passes from one carrier to another, is called electron transport system and is present in the inner mitochondrial membrane.” The electrons produced from NADH in the matrix of mitochondria during krebs/ citric acid cycle are oxidized by an NADH dehydrogenase (Complex I). The electrons are then transported to ubiquinone present in the inner membrane. This ubiquinone also receives reducing equivalents by FADH2 (Complex II). This FADH2 is generated during the oxidation of succinate in Krebs cycle. This reduced ubiquinone is oxidized with the transfer of electrons to cytochrome c with cytochrome bc1 complex (Complex III). The small protein cytochrome c attached to outer surface of inner membrane acts as mobile carrier that transfers the electrons from Complex III to Complex IV. This Complex IV is cytochrome coxidase complex which contains cytochrome a and a3, along with two copper centers. When the transference of electron takes place from one carrier to another via complex I to IV, they are coupled to Complex V or ATP synthase for the production of ATP from ADP. The number of molecules of ATP synthesis depends on the nature of electron donor. Oxidation of 1 molecule NADH results in 3 molecules of ATP. 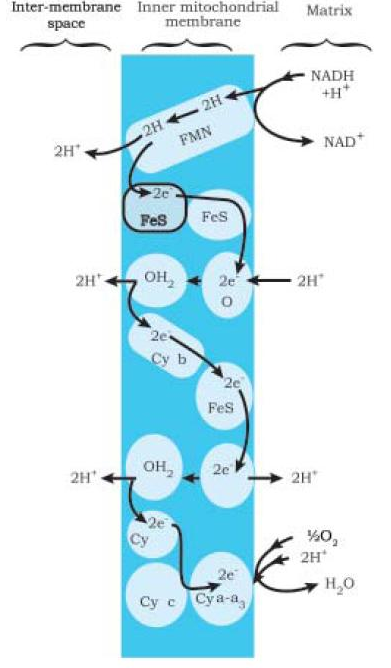 Figure given in the right shows the entire Electron Transport System in detail. It is important to note that presence of oxygen is important for aerobic respiration, but its role is limited in the terminal stage of the process. Presence of oxygen is important because it drives the entire process by eliminating hydrogen from the process or it can be said that oxygen is the final hydrogen acceptor. There is an orderly and sequential functioning of the pathway; with one substrate forming the next with glycolysis, Krebs cycle and Electron Transport System following one after another. The NADH formed during glycolysis is transferred into mitochondria and oxidative phosphorylation takes place. None of the intermediates in any process is utilized to synthesize any other compound. No alternative substrates except glucose are respired. All of the pathways work simultaneously but none of the above mentioned assumptions are really valid in living system. Substrate that enters the pathways are extracted as and when required, ATP is utilized as and when required, the rate of enzyme is controlled by several means. On the other hand, doing this exercise is important as it appreciate the efficiency and beauty of the living system in extracting and storing energy. Thus, there can be net gain of 36 ATP molecules from one molecule of glucose in case of aerobic respiration. 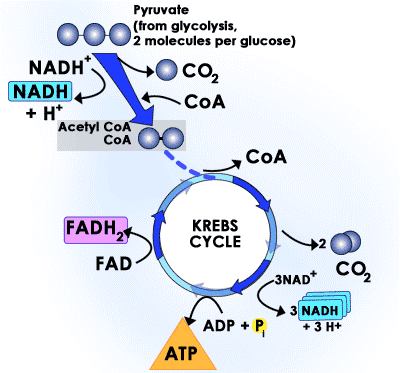 Krebs cycle is an example of Amphibolic Pathway because it includes both catabolism of fatty acids and carbohydrates and synthesis of anabolic precursors for amino acid synthesis. Thus, the pathway with both catabolism and anabolism potential is known as amphibolic pathway. When protein is used as respiratory substrates the ratio comes out to be 0.9. Protoplasmic conditions, i.e. younger tissues have greater protoplasm as compared to older tissues. Other factors, i.e. fluorides, cyanides, azides, etc. Q1. What is the metabolic fate of pyruvate? Sol. It depends on the requirement of cell. There are three methods in which cell handle pyruvic acid produced via glycolysis process. These are alcoholic fermentation, aerobic respiration and lactic acid fermentation. The fermentation is carried out in anaerobic condition in case of unicellular eukaryotes and prokaryotes. Q2. What is the difference between respiration and photosynthesis? Respiration takes place in all living cells, including green (Chlorophylls) and non – green. Photosynthesis takes place only in case of Chlorophylls cells. It occurs both in night and day and includes Glycolysis – in cytoplasm, Krebs cycle/ Citric acid cycle – in mitochondrial matrix and Electron transport chain and oxidative phosphorylation in inner mitochondrial membrane. It is a catabolic process which includes destruction of food. It is an anabolic process which includes the manufactured food. Oxygen is absorbed and carbohydrate is oxidized. Oxygen is liberated and carbohydrate is synthesized. It is an exothermic process and energy is released during respiration. It is an endothermic process and energy is stored during the process. Dry weight of plant decreases and potential energy is transformed into kinetic energy. In this case, dry weight of plant increases and light energy is converted into potential energy. Q3. What is cellular respiration? Sol. “The biochemical process, which occurs within cells and oxidizes food to obtain energy, is called cellular respiration.” This process is catalyzed by several enzymes. Glycolysis is the first stage of cellular respiration. Q4. What is external respiration in plants? Lenticels, i.e. opening in the bark of trunk. Stomata present in leaves along with green part of stems. Q5. Why during day, plants give out oxygen instead of taking it for respiration? Sol. In plants, oxygen is released during the process of photosynthesis in day time. This oxygen is made available for respiration. Moreover, the rate of photosynthesis is much higher as compared to the rate of respiration. Thus, plants give out excessive oxygen in day time. Added to this, carbon dioxide is released during night because photosynthesis stops in the absence of sunlight. Q6. Describe the significance of fermentation. In bakeries, fermentation is used for preparing bread, biscuits and cakes. In breweries, it is used in preparing several alcoholic drinks. Fermentation is used in producing vinegar and in tanning and curing of leather. In everyday life, this process is used in preparing curd, dhoklas, idlis, bhatura, etc. Q7. 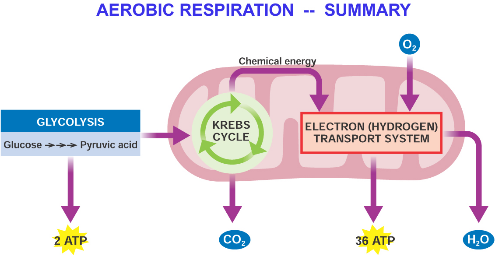 What is the difference between aerobic respiration and anaerobic respiration? In this respiration, oxygen is used. Oxygen is not used in anaerobic respiration. This respiration takes place in the cells of all higher animals and plants. This process takes place in fungi, bacteria and several endoparasites. Oxidation of glucose takes place completely. Partial oxidation of glucose takes place. The end product of this respiration is water and carbon dioxide. The end product in this case is carbon dioxide and lactic acid or ethyl alcohol. Oxidation of one molecule of glucose yields 38 ATP molecules. Partial oxidation of one molecule of glucose yields 2 ATP molecules. This process takes place in mitochondria and cytoplasm of cell. This process takes place only in cytoplasm. Q8. Write the equations of aerobic and anaerobic respiration. Q9. What is the difference between breathing and respiration? Breathing is the mechanism by which organisms obtain oxygen from air and release carbon dioxide. Thus, it includes expiration and inspiration. It includes breathing and oxidation of food in the cells of the organism in order to release energy. It is a physical process. Breathing is carried out by lungs. Respiration is carried out in lungs and mitochondria of cells. Q10. What is the difference between Glycolysis and Krebs cycle? It is a linear pathway. It occurs in cytoplasm of cell. it occurs in the matrix of mitochondria. It occurs in both aerobic and anaerobic respiration. It occurs only in aerobic respiration. It generates two NADH2 and two ATP molecules on the breakdown of one glucose molecule. 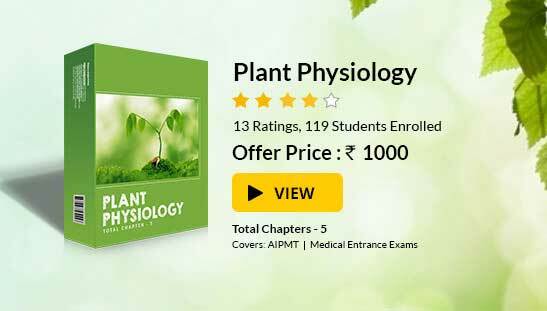 To read more, Buy study materials of Respiration in Plants comprising study notes, revision notes, video lectures, previous year solved questions etc. Also browse for more study materials on Biology here.